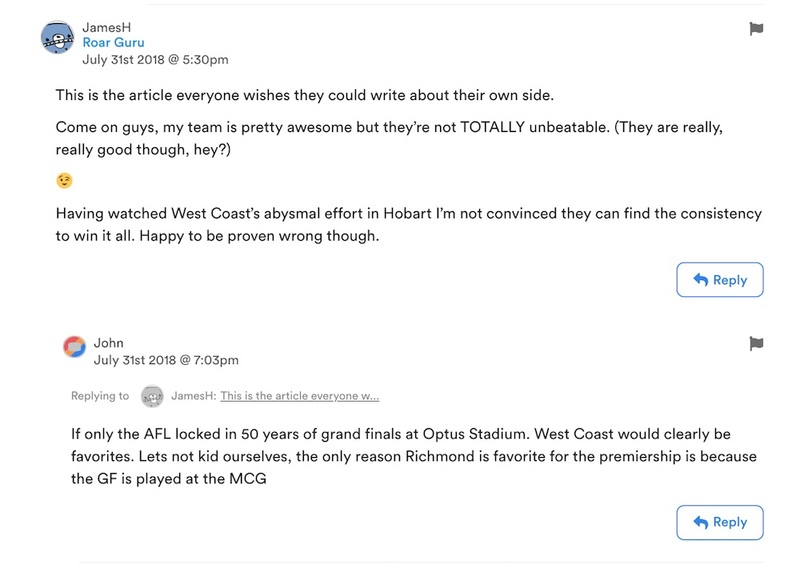 To make it easier to view comments, we’ve added a toggle to the top of the comments section that disconnects comments from their threads, allowing you to see all comments in the exact order they were posted, from newest to oldest and vice versa. As a standard, comment sections will have threads on and ordered based on the time the parent comment of the thread was posted. To extend upon the ‘Latest Comments’ widget, we are currently building out a page that will house a much larger selection of the latest comments, so you can easily keep track of where the discussion is taking place. August 28, 2018 – The new Roar is live! We’re proud to announce that a brand spanking new Roar is now live. What are you waiting for? Go on. Check it out! For more than ten years, The Roar has been the place for passionate and informed fans to meet, debate and engage with the sports they love. We’re excited to announce that from late August, The Roar will be launching a brand new site. Our aim? To provide Australia’s best sporting community with Australia’s best sports website. So what can you expect from a new Roar? In a word: community. Behind every decision during the redesign has been a determination to find ways to put our users front and centre. Every Roarer who logs on, who reads the opinion of a first-time author, who debates the weekend’s talking points, who captures and submits the next classic Club Roar moment, who leaves a comment, or of course, who submits their own article, is a key part of what makes The Roar‘s community strong and the site one of the most unique destinations on the internet. That’s why we want the new Roar to shine as much light back on you, the users, as possible. Of course, everything that has always made The Roar unique will not only be maintained, but built upon. 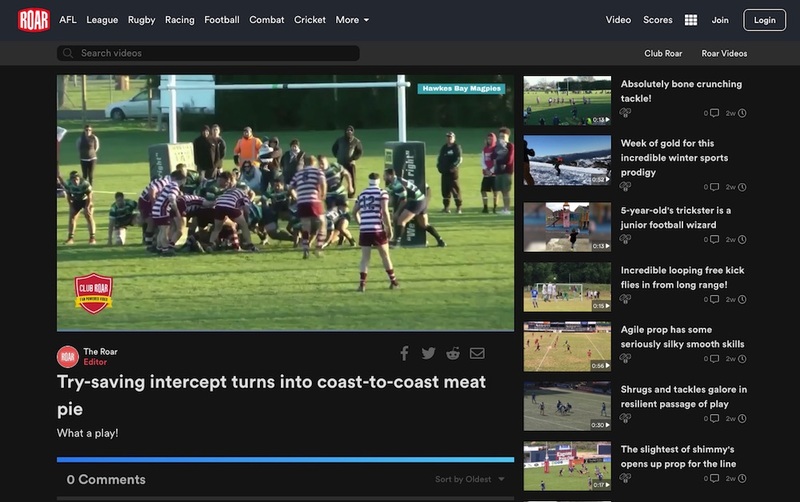 The homepage will provide an opportunity for Expert, Roar of The Crowd and long-form articles to feature prominently alongside videos and Club Roar, while also maintaining a clear distinction, allowing you to find what you’re after easier than ever before. The ‘published’ list on your profile page will now include videos, as well as the ability to see the status of your submitted articles when you’re logged in. 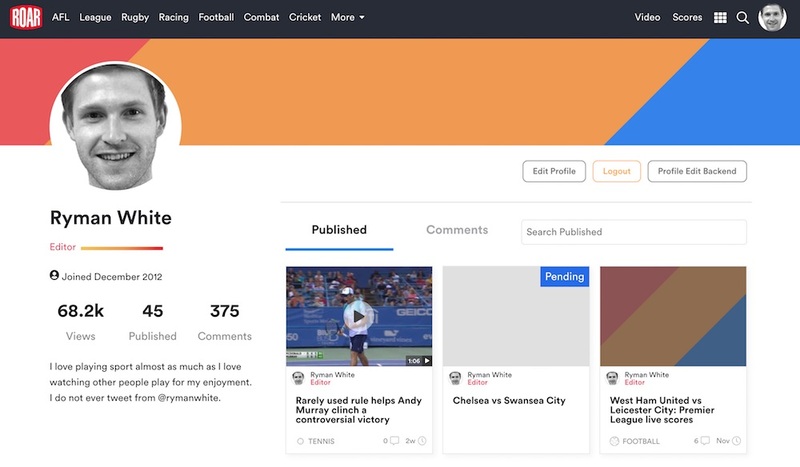 The new profile pages will also make it easier to see comments linked to an account and include a search function to help find articles or comments from a particular user. The new Roar profile with published videos and a ‘pending’ article status. Your profile image will be more prominent than ever, surfacing as your avatar across the site alongside your articles and videos on the homepage, in the community leaderboard, and to track responses in comment threads. 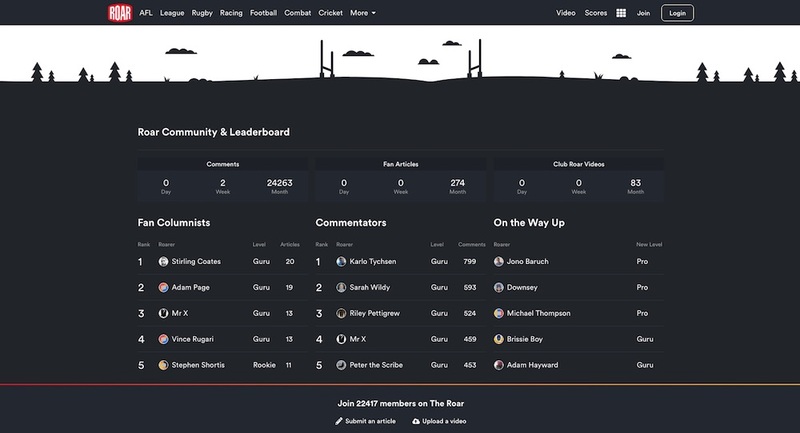 The Roar’s new community leaderboard. We’re also bringing commenting to the new video section. If you’re logged into your Roar account, this will allow you to comment on and discuss videos just as you do currently on articles. And it will also be a great place to kill some time checking out the best Club Roar has to offer! The Roar’s new video section. During the relaunch, we’re keen to hear any and all of your feedback. As always, please don’t hesitate to get in touch with your thoughts, comments or concerns via our contact form. The site may be getting rebuilt, rewritten and redesigned from the ground up, but we promise The Roar you know is only going to get better. You can check on this page for announcements from The Roar’s team. We’ll be keeping it up to date with all the latest from Roar HQ, as well as information on events and additions to the site.